Another week and weekend has come and gone and I haven't had any time for writing. Putting this together quick on Sunday night which means not everything will be covered. But, here are some highlights from the week! I loved Easter Cat and Santa Cat is just as fun. I think if this series is new to you, it almost makes more sense to start with Easter Cat, but Santa Cat can be read on its own. I think it's a great book to use as a mentor text for point of view and to show how illustrations can tell the story. Who is the narrator in the story? And use it just because it's a fun book! I really didn't know which way this book was going to go before I started - and it took me by surprise! It went in a direction I did not expect but had me laughing right away! Just a fun book. 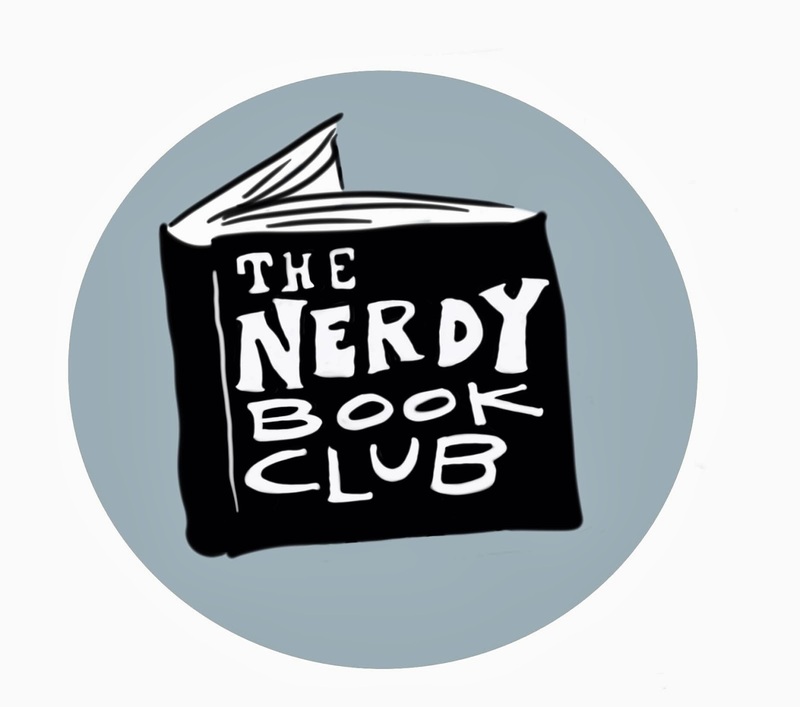 If you haven't read this book, it's a must read for Nerdy readers! Hilarious, but entirely inappropriate for children. Older readers will get the humor. "Happy Gilmore" enthusiasts may as well! I've covered this series before, but have recently started using it with students. I love this series for readers who need accessible nonfiction texts. The photographs are fantastic - engaging and eye-appealing for young readers. They don't shy away from the grotesque! I wish there were more nonfiction features and additional information provided. Even though they are "earlier" readers, I think there could be a little bit more done with the books. I just preordered some titles in the series - great animal stories in our future! I noticed they will also be printing titles in the transportation family, including "Bullet trains", kids will love this! I'm a fan of Lu's "Legend" series, but I didn't know if she would be able to part from that genre. While still in the fantasy genre, Lu's newest series departs from the dysopian society to one that would have existed centuries ago. New characters, new setting and new plot, but same fantastic writing style. Great new story for the YA crowd. Due to the content, I would recommend for a mature middle grade reader. Still reading El Deafo. So many library books to get through, I didn't finish this one yet. I love what I have read so far! I ended up abandoning Garth Stein's newest, I just couldn't get into it by page 50 (my abandoning point). I may return to it one day, but have too many in my stacks that I want to get to! Will start Jodi Picoult's newest this week. Also got The Haunted Library by Dori Hillestad Butler. Hoping to get that read and out to the kids this week too! Several bloggers have written about this recently published book, Fall Leaves, written by Loretta Holland and illustrated by Elly MacKay. After reading this book, it's one that needs to be talked about and shared again! This gorgeously illustrated book begs to be read over and over. Young children will enjoy the quick read of the 2 word phrases on each two-page spread. "Fall leaves" and "Apples fall" are examples of phrases that are accompanied by beautiful illustrations that are done with ink, yupo paper, light and photography that make you see the illustrations from different perspectives. The phrases also include homonyms, such as leaves ("Fall leaves" with an illustration of gorgeous fall leaves) and leaves ("Fall leaves" with an illustration of a bare landscape starting to show signs of winter). Ready for a longer read? Then go back and read the fall facts that accompany each page, detailing what happens in nature as the Northern Hemisphere slowly rotates farther away from the sun. Each page gives additional information about what happens during this season - how the weather, trees, leaves, vegetation and daylight changes. This book would be a fabulous story to use every fall. It will be a perfect book to include when teaching the 1st grade NGSS standard "Space Systems: Patterns and Cycles". It's October, which happens to be one of my favorite months in the school year? Why? Because routines and procedures are established and now we can get into teaching and learning. I know my students, I've matched them up with books and now I'm seeing them grow. It is always very exciting to see students find a series or books that they love. They return to them over and over, they talk about them with other kids, and they want to share them - with other kids and with family at home. I love introducing them to some of these characters. I feel like the characters are old friends who I can't wait to have them meet my new students. When they "hit it off", it's such a great feeling, to stand back and see everyone get along! The best part about this is I work with students who find reading difficult; for whatever reason, reading can be hard. To see their eyes light up when I read to them, and see their desire to return to that book, is very rewarding. Kids who never thought reading was for them, are now willingly reading. It's a timely book since Halloween is around the corner, but those carrots can be creepy, and tricky, any time of year! I will never forget what a cloven hoof is again! I think these are the most clever graphic novels on the market right now. The stories about school and justice go together so well! This really is a great time for graphic novel series, so many great series out there, but this one really does storytelling justice! I can't remember the last time I laughed out loud so many times when reading! I love Squirrel's neurotic side and Bird's happy-go-lucky attitude, even if he is flying into the side of a mountain! Fly Guy has a market all to its own. Arnold has done a fantastic job of bringing humor and a well written story to a level of readers that spans not only grade levels, but reading levels, too. We need more series like Fly Guy! This series has a new revival with the full-color illustrations by Dan Santat. A great series for a variety of students, this is a popular series for many kids! With the newest in the series The Pigeon Needs a Bath, this series came back from a little lull with a bang. All books are funny, but this one is a goofy hit for sure! Mercy, the porcine wonder, is a great series for kids who are ready for chapter books, but need a little help on the way. While it doesn't hold back from some challenging vocabulary, it also provides familiar characters, similar plot lines and gorgeous full color illustrations. The brilliant Kate knows kids. I love that she can write for a variety of audiences and do it so well. Just like in Mercy Watson, Bink and Gollie don't shy away from vocabulary (bonanza), but they have such voice in their conversation that pulls kids in for more! I really hope we have not see the last of these two friends! Elephant and Piggie series by Mo Willems. Mo knows kids. You can't lose with Pigeon or Elephant and Piggie. Such a simple concept, and told with a minimal amount of conversation. But the voice... the expressions... the hilarious concepts (a bird on your head??). Always a hit with kids! Try any of these books with kids - reluctant readers to those with a voracious appetite. I'm so happy I have these books to share with kids. I caught up on some reading this Sunday, but it seems like there is always more to do! I read Sam and Dave Dig a Hole this week and it's begging for another read before I review it. I need a little more time to process it! I have a huge stack of books that I need to get to, just not sure where I'll get the time! Last week I was supposed to update my #MustReadin2014 books, but with as crazy as I've been, it didn't happen. I'm attaching it to the bottom of this post, but not much was crossed out! I've resigned myself to the fact that I'm not going to get to the adult books, but that's ok, so many great books have been read this year! I think I may be a little pickier with my 2015 picks! Love how strong and determined Ruby is! Great story to encourage students to work hard at their goals. I read this story years ago, but it's always fun to pick a story up after years of not reading it, it's always interesting to think how a different class would react to the story! I really liked this book for students to learn about what the people went through as they traveled the Oregon Trail. So much can be learned by the narrative stories - different from a dry, historical account, I think it would be interesting for kids to read this with the lens of "What can I learn about the Oregon Trail?" There are very detailed end pages, with the author detailing her own car trip of the Oregon Trail in 2008. 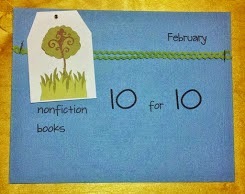 I read books 1-4 this weekend and #5 has its Book Birthday this Tuesday! This is such a great series for kids. Young kids who are ready for chapter books will love this series, as will kids who are a bit older but just enjoy reading a good book. I'm so thrilled that this series has been republished with Dan Santat illustrations. His full color pictures bring the book to life, so much more than the original black and white illustrations. The comic pages will entice readers to return to the series again and again. The flip-o-rams pages, which are even written to be cheesy, are cheesy, but kids will love them. 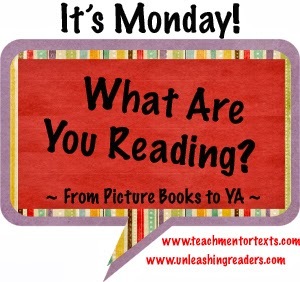 I'm thrilled to have a fun series to pass off to my reluctant readers! This book had a very interesting concept. It was actually 2 books in 1. The chapters alternated between the story of the writer and her life - which had plenty of drama - including how she brought her story to life, and the story of the story. The main character is Darcy, a recent high school grad who wrote a novel in 30 days. Her story is about what happens after the novel is purchased by a publisher and what happens from that point to publication. I really enjoyed hearing about this side of publishing, since you don't always hear everything that goes into the pre-pub life of a book. Darcy falls in love for the first time with another female writer and their lives intertwine while trying to both work on their novels. However, we also have another story to follow with another main character, Lizzie. Lizzie's story is the novel that Darcy is writing. We get to read that whole novel, as well. I enjoyed Lizzie's story the most, which is about her journey into the afterworld - although not dead, she is able to go between both worlds. The writing was very good, but there were parts that I had to push through. Something about it held me back a bit. I thought it was interesting to see what Darcy was thinking about her story and how it came together while reading the story. Good read for high school students, I would love to hear how they interpret the many levels. Isn't this how it always works, lots of great books out to read but also a lot of great books just came into the library for me?? I'm starting El Deafo, but I'm also trying to get through these library books before they are due: Garth Stein's A Sudden Light, Marie Lu's The Young Elites and Jodi Picoult's Leaving Time. This book is such a great find! Perfect if you teach animal adaptations. It's easy enough to read and understand for younger readers and has great illustrations to help students visualize the difference between animal skeletons and human skeletons. Fans of NFPB should definitely check this one out! I like this series, but it seems that I always find something to fault in each one. This one felt like the content was even more diluted than others. It brought across the point, the theme (which I think all the books in the series have) in which to question and feed your curiosity. There seemed to be more of a graphic novel feel to more pages in this book than the others in the series, but some of the silly comments will be lost on young readers. I found it interesting this book had source books and additional reading titles. I don't remember the others having that! Even though there just isn't much time for reading anymore - so many things to do, so little time - I still found some great books! This was my surprise read of the week. Laughed out loud numerous times. Funny story with a great lesson! This book reminded me of Battle Bunny while staying original to its own story. Loved the voice in this book - told in a circus announcing tone, we hear the many reasons why Max isn't going to bed. Cute story for the younger crowd. I can hear young kids cracking up in this great read aloud. Love this beautiful read aloud for young kids. Depicts fall moving into winter and what animals are doing to prepare for the upcoming season. This was my second surprise of the week. Sweet story but beautiful illustrations. This is one I will be adding to my collection. Love this picture book that is more for upper elementary students than primary students. It's full of Bob Shea one-liners, but is written at a more sophisticated humorous level that will be better appreciated by the older crowd. I was waiting to be uber creeped out, but it never got that bad that I couldn't read the book at night :) I liked the adventure, I liked the kids-facing-growing-up theme that framed the story. I think the writing was better in this year's Night Gardener so I'm hoping there will be a matching shiny sticker on it this year. Hmmmm... not too far in this long book, but the verdict is still out on this one... It's different! 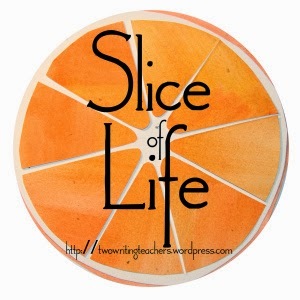 It's been awhile since I've posted anything on the Celebrate link up or the Slice of Life link. Life has gotten too busy. But I just got back from a gorgeous run and felt the need to do a quick write on it! It's a beautiful day for a run in north suburban Chicago! We had our first morning of frost, so it's brisk, but with a cloudless, sunny day, it didn't take long to feel warm! I took a new route this morning. I often run from my house, pounding the streets and sidewalks. But today I went to a local savanna that recently was connected to one of our forest preserve trails (well, technically I went under a rope and around a gate, so it might not have been technically open yet...). What a gorgeous run! Many leaves are changing colors so the view was just beautiful. The tail is crushed limestone so much better for my feet and knees than concrete and asphalt! With the brisk temps, it was a comfortable run and the 8 miles passed quickly. Just a beautiful way to start the morning! Tomorrow is the Chicago Marathon. Whether it's the temperature or the beautiful Chicago skyline views, I hope all the runners find inspiration and just keep running! This week is the book birthday for the new Steve Jenkins and Robin Page collaboration, Creature Features. The duo always amazes me with their layouts and fascinating animal information. This one is no exception! Each page is a letter to the animal asking the animal a question about their feature. Then there is a short response from the animal explaining the purpose of that particular feature. "Dear mandrill: Why is your nose so colorful?" "My bright red and blue nose tells other mandrills that I'm a full-grown male monkey, so they'd better not mess with me. My rear end is pretty colorful too, but I'd rather not talk about that." With Jenkins' trademark torn and cut-paper collage illustrations, each page shows a close up to the animal's unique feature. This is another book that young children will pour over. Teachers will enjoy using this book in class, and going back over for several reads. After just enjoying the book, it begs to go back and classify the different features and put the animals into groups. Using the information in the back of the book which shows a map cutaway showing where each animal lives, students could discuss how the feature helps them adapt to their particular environment. During math, using the same back pages (which show the animals in comparison to a human), students could estimate the size of each animal in comparison to an average male. So many cross-curricular activities! Thank you Steve Jenkins and Robin Page for another fantastic book! We are getting ready for our Fall Scholastic Book Fair so I tried to get caught up with some of the titles that will featured at the book fair this week! This is such a beautiful fall book! Wendell Minor is such an amazing illustrator and this book, with all of its fall colors, is simply gorgeous! I love the way Minor makes the pumpkins personality come to life in all of the different locations across the United States. Wonderful book to add to your fall collection! The back of the book jacket says, "Style is all in how you look at it." I love that quote. That should sum up art - it's all in how (and I think who) looks at it. Cute story. Loved the miniatures by Hannah E. Harrison. Fun, wordless picture book that shows a young boy imagining himself traveling to Africa and drawing the many animals he meets there. Fun to think about what the conversation would be between the boy and the animals. I liked Flora and the Flamingo but I really love Flora and the Penguin. I felt there was more to the story in this one - Flora and the Flamingo had their friendship going, but this time, Flora and the Penguin have friendship, their ice skating, and the problem with the fish! I love the story on top of the ice and the story below the ice! And just like in FatF, the artwork and the picture flaps are so amazingly done, so amazingly placed. Molly Idle is the Queen of the wordless picture book! So glad to read more Raina stories! I know kids will love this graphic novel but for me, she wrote my childhood. I loved seeing Strawberry Shortcake dolls, Wilson Phillips lyrics and feathered bangs!! I enjoyed how this story went back and forth from Raina's teenage years and when she was a kid. Great new series for fans of "I Survived". Present day fiction that shows a natural disaster. Kids in 2nd-4th grade will really enjoy this new series. I enjoyed it, but especially the ending. That's when the action was quick, fast and furious and there was no way I was going to bed until I finished it! This is the second "heist" book I've read this year, the first being The Great Greene Heist. I think overall, I enjoyed TGGH better - I liked the middle school atmosphere, the kids working together to overcome a bully. Loot had more of a kids being bad, but not really feel, and more suspend your belief action. TGGH had that too, but I think with the kids in Loot traveling cross country, it seemed even harder to believe!